Growing a lemon tree is surprisingly easy – even indoors. And they make gorgeous plants – green all year round, with dark shiny leaves. Getting a lemon tree to fruit takes a bit more planning and effort, but it’s doable. Read on for tips on how to grow a lemon tree. Basically, lemon trees need a lot of light (artificial will do), protection from cold weather and – if you want fruit – access to bees and insects that pollinate them. Lemon trees make beautiful indoor plants. If you’re not concerned about growing your own lemons, it’s pretty easy to grow a lemon tree indoors. They like their soil slightly acidic and evenly moist. Temperatures of 70 degrees during the day and no lower than 55 degrees at night suit them. Their containers need to drain very well. 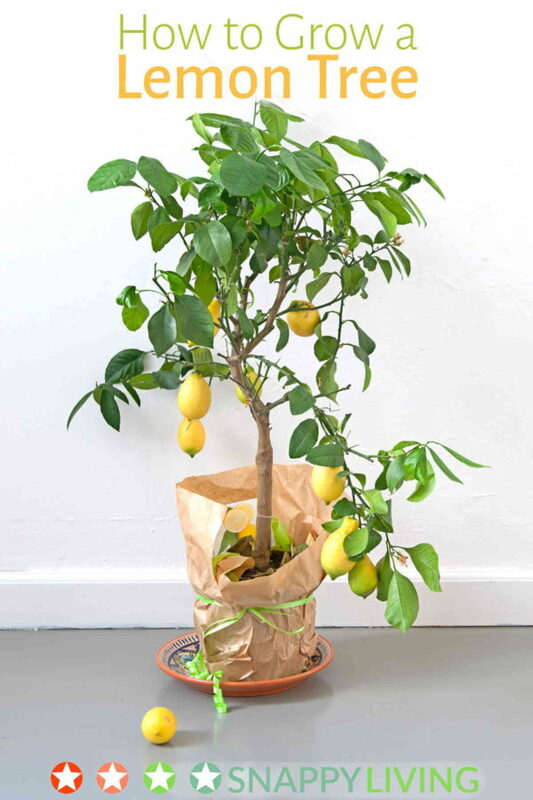 Because lemon trees can grow very tall, instead of using a lemon seed from a grocery store lemon, you might want to buy a 2-3 year old dwarf variety plant specially bred to grow indoors. Meyer lemons are a good choice. If you prefer to grow from seed and just see what happens (you’ll get a nice houseplant for at least a few years to come), see below. Invest in the right soil. They need slightly acidic soil – any nursery can give you tips on what to get. Set them somewhere that they get twelve hours of full sunlight through a window, ideally southern exposure. If you don’t have this exact combination, don’t worry – lemon trees are hardy and can grow well under less than ideal conditions. Mist the plant daily and keep the soil evenly moist – no little babbling brooks running through their potting soil. They also like having their leaves gently wiped with a moist sponge. Lemon trees are only hardy in U.S. Department of Agriculture planting zones 8b through 11. That’s just the very southernmost part of the US, and some bits of California. If you’re outside those zones, then your lemon tree is going to struggle with frost, and you might be better off trying to grow fruit trees that can take the cold. You can grow lemon trees from a seed, but they don’t always grow “true to seed” – especially as some grocery store lemons are hybrids. This means the offspring lemons may not resemble the parents at all, and may not be edible. To ensure you will have edible lemons, go to a local nursery to get a plant. Or you can plant a lemon tree right in your yard, in a spot where it gets full sun or close to it. Keep it watered at all times to produce juicy fruit. Protect it from the cold by putting wood shavings around the base of it about one foot deep. Prune it to encourage growth and sprouting, especially if it’s not producing much fruit or is too big. In winter, put nitrogen and potassium fertilizer around the base of the tree. You’ll need advice from a local nursery to get the right amount for your area and soil. In warm weather, water the tree well at least once a week – never let it dry out. Harvest lemons as they grow to ripeness individually. Watch out for “citrus scab” – those brown, cork-like spots that sometimes appear on fruits and/or leaves. Humidity is the cause, and putting the tree in a breezy area will prevent it; if that’s not a possibility, prune so there’s plenty of space around budding lemons for air to circulate. But if you just want a gorgeous indoor or outdoor tree and aren’t concerned about having edible fruit. Save seeds from a lemon you’ve used in cooking or whatever. Wash the seeds in tap water. Moisten about three regular-size paper towels and layer them. Fold them in half – twice. Put the seeds in the middle and fold again, several times so they’re well covered. Put the paper towels on a plate or shallow bowl so you can pour water on it and keep the paper towels moist continuously. Cover this with plastic wrap or a lid so it doesn’t dry out. Put this somewhere in your home that’s fairly warm but out of sunlight. Once you see a sprout coming out of the seed and leaves starting to emerge, fill a paper cup with potting soil. Put the seed into the potting soil with its leaves just below the top of the soil. Stick this in sunlight. In time, the plant will outgrow the cup. Be ready with a container about twice the size of the paper cup. If it’s plastic, it’ll need a few holes in the bottom so water can drain out. When the plant outgrows the little cup, simply scoop out the soil and seed carefully, keeping it all as one intact lump, and put it in the soil in the new container. Some varieties of lemon tree grow up to thirty feet wide and thirty feet tall. Not all types of lemon seeds will produce lemons that resemble the lemon that produced the seed – some will. If you really want to produce your own edible lemons, do some research and talk to local gardeners to save yourself wasted effort down the road. It also has thorns. is this normal ? Helene, most lemon trees do have thorns, so I would guess it is normal! What is the best time to prune an outdoor in ground lemon tree in Arizona? From http://ag.arizona.edu/pubs/crops/az1455.pdf, Feb to Apr. I have a dwarf meyer lemon tree that is four years old. Fruit production was somewhat low this year, and the tree did a strange thing by producing 4-6 very large grapefruit size lemons which were inedible. Do you know what caused this? Hmm, I’ve never heard of that. From what I’ve read, citrus trees hybridize very easily. Is there any chance it got pollen from another citrus tree of a different type? I’m not even sure that would cause what happened, though – it’s just a guess. I would suggest asking a local nursery. I did a search online and didn’t find anything, but people who work at nurseries are more likely to have heard about all sorts of weirdness! :) If you do find out what caused it, I’d love it if you dropped a note in the comments here, in case it happens to anyone else. What do i do to pollinate a non edible lemon tree. Why cant we eat our lemons. ?